This summer, the concrete leg of the Anthony Henday ring road on the south side of Edmonton underwent a maintenance and repair project. Both concrete and asphalt road surfaces are susceptible to settling due to the compaction or erosion of subsurface soils. With asphalt roadways, Martech would recommend a subsurface soil stabilization foam like Prime Flex 920 permeation grout. This concrete slab lifting project used Precision Lift 3.5 compaction grout. Precision Lift 3.5 can also be used to lift sidewalk slabs, warehouse floors, concrete driveway, airport runways and other transport facilities. In 3 days, the contractor's Prime Resins team repaired settled concrete slabs along the 11 km stretch of highway. In this section of the ring road, the six-year-old highway had settled as much as 2″ (51mm). Using Precision Lift 3.5 resin, the local Prime Resins contractor was able to quickly drill and inject the lifting foam into the subsurface space to lift the slab back to a level grade. Using Prime Resins Precision Lift compaction grout, the contractor was able to lift and repair concrete panels approximately 3m x 6m in size in less than 60 minutes. This made the repair work go weeks ahead of schedule! If you have a slab lifting project (either small or large scale), be sure to contact Martech before committing to a slab lifting material different than Prime Resins. The North American Society for Trenchless Technology, NASTT, is a trade association that promotes the installation and renewal of underground utilities using no-dig, trenchless methods. Their 2012 Northwest Trenchless Conference was held in Edmonton, Alberta. The innovative members of NASTT bring valuable new information to our infrastructure sales team during these events. Martech’s Liang Yu, M.Sc Chem, M.Sc Materials Eng, attended this year’s Trenchless Conference to learn about the most current trenchless technology available for local projects. Liang also used conference to network with engineers in the Trenchless Industry to introduce innovative pipeline and manhole relining solutions. Martech invests in keeping its team up to date on market trends and seeing new technology that we can offer to our customers in Canada. Thank you NASTT-Northwest for a terrific, worthwhile event! The Vermillion dam and bridge crossing has been an integral part Central Alberta’s reservoir and irrigation system for decades. The cold joints at either end of the dam have recently separated. This deterioration has created a gap in the wall as wide as 3.5″ at certain points. This cold joint separation can lead to increased amount of pollutants in the reservoir, road deterioration and, if left untreated, a catastrophic failure in the dam and bridge. Alberta Transportation investigated several repair options for this bridge, but they all required the reservoir to be drained to facilitate the rehabilitation project. Draining the reservoir was a massive expense that went far beyond the budget scope for this type of project. They needed another way to repair the cold joint separation. Prime Resins and a local contractor partner were able to provide an innovative cold joint repair. Using Prime Resins Oakum saturated in Prime Flex 900 to seal the surface of the cold joint gap. With a new surface in place, Prime Flex 900 was injected into the annular space to seal the remaining subsurface gap. Finally, a protective epoxy cover was applied to the surface. All of the products used to fix this cold joint separation are NSF61 Certified, safe for drinking water. This means the reservoir water is not at risk from toxic sealants or roadway contaminants. Alberta Transportation saved substantial costs by completing this repair project with Prime Resins instead of a) trying alternative repair methods or b) doing nothing and allowing the problem to continue into the future. Contact your local Martech representative to discover what innovative solutions we can bring to your transportation rehabilitation projects. Martech’s infrastructure experts will make your job easier. Under a road where the traffic is too high to dig up the roadway and replace the line. Look at this culvert: 30 feet of soil above the pipe. Digging this up and replacing it would take weeks and tens of thousands of dollars. Photo: deteriorating culvert in Saskatchewan where the municipality can use Centri-Pipe to reline the pipe instead of digging up the road and replacing the culvert. In this location, there is 30 vertical feet of soil above the culvert pipe and it is not feasible to dig and replace. APM Centri-Pipe is the best option to save this culvert. Culverts that were constructed during the 1980s are deteriorating and most are scheduled for replacement. Martech and AP/M Centri-Pipe want to introduce you to a proven culvert relining process that will save money and time for your department. Photo: APM Centri-Pipe culvert relining before and after comparison photo. Before relining with Centri-Pipe, the culvert's bottom (invert) had almost entirely corroded away and a large amount of soil had been removed by erosion. A recent update to the Martech Web Warehouse makes communicating stock instructions to Martech easier and faster than ever! The Guaranteed Stock button and Martech’s new Guaranteed Stock Process gives Web Warehouse customers a fast way to identify products they need a consistent, guaranteed supply on. This is the perfect place scenario for us to use Guaranteed Stock. (4) scheduling future follow-up calls with you to see if the stock level is meeting your needs or if it needs to be adjusted. If you have a need for Guaranteed Stock with Martech, log into the Web Warehouse and click the button to see what happens! Martech’s Municipal Infrastructure Group is pleased to announce the appointment of Mr. Matt Jones as our Sales Territory Architect for British Columbia. Welcome to Martech, Matt! “I look forward to bringing my current skills to the Martech team, being coached and developed as a sales professional and delivering profits and success to my partners in the BC territory,” concludes Matt. Matt has a successful selling history within the waterworks market in BC. His expertise with distribution selling and manufacturer representation will support Martech’s sales team in leveraging our combined skills and talents to be the hottest contracted sales company in Canada. Matt started with Martech on Tuesday, Oct 9, 2012 and will be based in Martech’s Coquitlam, BC office. Please call or email Matt with a welcome message or send him an infrastructure question or opportunity. LinkSeal modular seals allow a 20" pipe to penetrate this concrete wall and seal out groundwater from the other side in the Calgary Airport Expansion project. The Calgary Airport is expanding to service the growing needs of the community. Obviously, preserving the structural integrity of the new airport buildings is paramount to the financial and practical success of the expansion. ◾Leaking water can erode the concrete wall, decreasing the life of the structure and necessitating repairs. ◾Leaking water can become a health hazard for individuals inside the building since the water is untreated. Traditional pipe penetration installations would core a hole through the concrete wall. Coring through a concrete wall can cause damage to the rebar reinforcement in the structure. Coring can break chips of concrete out of the wall and creating cracks in the concrete wall due to the additional stress of the coring machine. The Calgary Airport Expansion engineering and construction team has avoided these risks and consequences by using GPT Century Line Sleeves and Link-Seal Modular Sales for their pipe penetrations. To safely and efficiently create a pipe penetration hole in the wall, Century Line sleeves are mounted in the wall and the rebar is bent around the sleeve prior to the concrete pour. The sleeve is cast in place and popped out of the wall after the concrete is poured and cured. Now there is a hole for the pipe penetration without any damage to rebar or concrete. After the pipe is run through the wall, Link-Seal Modular Seals are installed around the pipe in the wall penetration. Link-Seal Modular Seals are mechanical seals that prevent any leaking through the structure at the point of entry by the pipe. Use GPT Century-Line Sleeves and Link-Seal Modular Seals to get leak-proof seals around your pipe penetrations without jeopardizing the structural integrity of new buildings. Martech stocks Link-Seal and Century-Sleeves for customers in Canada. You may need assistance selecting the model and quantity of your Link-Seal ring. No problem! Contact us to learn more! Whenever a new innovation enters the infrastructure market, Martech distributes detailed specifications and support for Engineers, Municipalities and Contractors. Making sure these groups have effective design tools for their projects means Martech will have good success introducing the new product in the field. New innovations can increase input costs for the engineering firms who first utilize these products. Engineers understand the value new products can bring, but still need to spend time updating their designs to implement them properly so their clients can reap the benefits. Air valves for water pipelines are one such innovation. Sample CAD drawing showing full installation of ARI air valve for engineers to use when designing pipelines. Air release valves are components designed to release air from water and wastewater pipelines and prevent failures in the pipe due to air expansion and water column separation. Self Contained Direct-Bury Air Release Valves allow utility operators to maintain these pipeline components for a fraction of the time and cost traditional air release valves require. Martech has been increasing their support for partner engineering firms by contracting the design and production of “Full Installation” CAD Drawings for their Self Contained Direct-Bury Air Release Valves. Full Installation CAD Drawings are different than standard product specification drawings. Martech is providing Full Installation drawings so engineers have all the design information and material requirements in a format that lets them copy and paste or drag and drop the drawing directly into their design. Full Installation CAD Drawings are a tool from Martech for engineers to support their projects and provide more value to their customers. Using the CAD drawings provided by Martech, the time required for the engineer to specify these air valves and utilize their capabilities goes down from 2 or 3 hours to about 10 minutes. 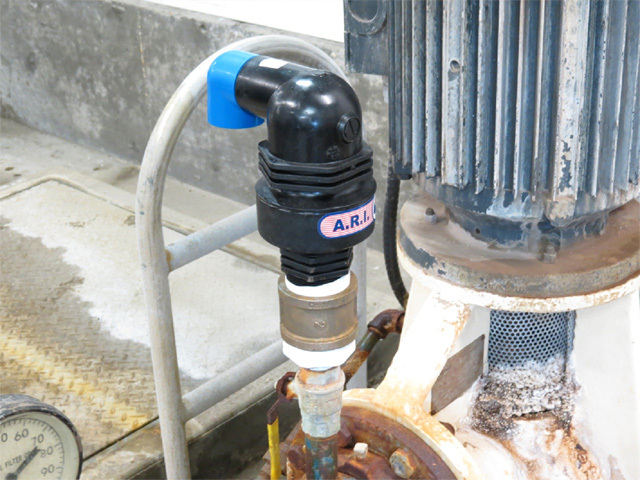 Are you designing a pipeline with air release valves? Contact us to request a Full Installation drawing for your project OR to see a sample DWG drawing. To work on the infrastructure inside this manhole, crews have to lift this heavy access cover casting out of its seat and drop it on the ground. To reinstall, the worker has to lift the heavy casting up over 24" to get the cover back into its seat. This patented design by EJ includes a pivoting stainless steel rod, which provides cover lift and rotation with minimal effort. The cover glides to the side, remaining fixed to the frame. Operators no longer need to risk strain or injury by awkwardly hoisting heavy covers when opening or closing the unit. While out for an evening stroll in a local park with my wife, I noticed our local utility had installed raised manhole barrels to prevent surcharging during flood events from the nearby river. The attached photograph shows that the utility is concerned about security of the system, and has gone to some lengths to secure the casting. This type of installation presents utility maintenance crews with an additional challenge: What do maintenance workers do with the cover when it is removed, and how do they reinstall the cover? Removal will mean taking the cover off of the structure then using a lift assist device (or second worker) to put the cover back in place. EJ has developed the innovative Revolution® access cover assembly to addresses the problems of infrastructure security and worker safety. The Revolution® cover is permanently and securely mounted to the casting frame. Unlock, lift and easily swing sideways to safely open the cover. Gravity and friction hold the cover open while maintenance work is underway. When work is completed, the Revolution® cover is simply swung back into place on its permanent sealed seat, and secured with EON bolts or optional padlocks. Simply stated, “A Walk In The Park”. Download the Revolution® one-page data sheet and review the product description and photos. Contact Martech to learn more about the Revolution® and other innovative EJ infrastructure solutions. Water treatment in large urban communities is an ongoing concern for utility operators, administrators and citizens. Water clarifiers play an important role in water treatment cycles by removing heavier sludge and solids from raw untreated water. 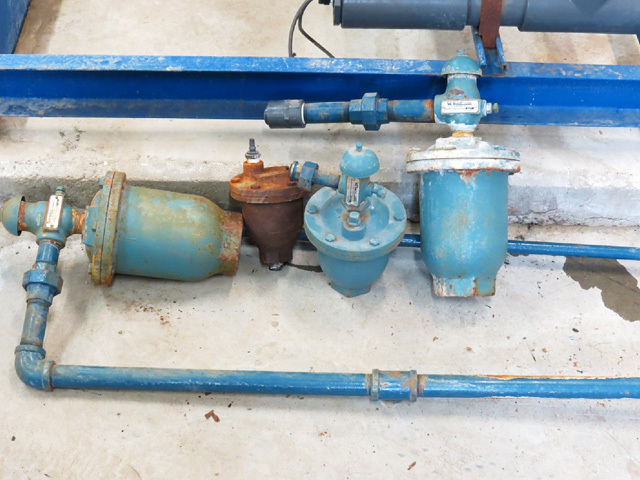 Due to population growth, a community in Saskatchewan completed a water clarifier refurbishment project and brought an old piece of infrastructure back online. This concrete water clarifier developed flaws and defects over years of use. Cold joints in the concrete had started to leak and large cracks were allowing significant amounts of ground water to infiltrate into the clarifier body. Honeycombing in the concrete was beginning to appear and that added to the leaking problems. Before this clarifier could be used again these leaks had to be stopped. The city needed a durable leak-sealing solution that would stand up to the demands of daily water production. New Shield Restorations, a Martech partner contractor, was contracted to solve this problem. The contractor was very experienced in using polyurethane resins and had no reservations taking on this large undertaking. New Shield Restorations relied on Prime Flex 900 XLV by Prime Resins to solve all the leak issues. Prime Flex 900 XLV is an environmentally friendly polyurethane resin that bonds with concrete to form a tough, flexible, watertight seal. It is safe for drinking water (meets the NSF 61 standard) and is the best injection product for sealing leaks. Prime Flex 900 XLV is a “hydrophilic” resin – it chases water as it reacts. The resin gets into the smallest cracks where water is leaking then reacts with the water and expands to seal the leak permanently. Using one touch packers and high pressure mechanical injection ports, the New Shield team injected the Prime Flex 900 XLV resin into active leaking cracks, cold joints and honeycombed concrete voids. This refurbished concrete clarifier structure was quite large, approximately 100′ x 100′ x 25′ deep. After a week of carefully sealing all leaks, the project was finished and the clarifier was ready to be brought back into production. Are you a UTILITIES OPERATOR with leaking concrete infrastructure? Are you a CONCRETE REPAIR CONTRACTOR searching for better leak repair solutions? To learn how to use chemical grouts to stop leaks and seal all manner of concrete infrastructure (water channels, manholes, storage tanks, anywhere water is leaking through concrete) contact us to request more information from Martech’s Municipal Infrastructure team. In typical cased crossings, a single carrier pipe is placed in a casing pipe in order to allow the buried carrier pipe and its contents to be protected underneath road, rail and other infrastructure. In applications such as a water treatment plant or a refinery, where there are dozens of pipes that need to be protected, creating a cased crossing for each individual line is costly in both time, construction area and building capital. To save time, space and cost, utilities have experimented with running multiple carrier lines in a single casing. This tactic will work – unless there are different hot and cold contents flowing in the carrier pipes. Heat expansion in one line but not in the others as it can lead to a catastrophic failure in the entire system! When one or two of the carrier lines has a higher heat expansion rate than the others in the crossing, the casing and all of the carrier lines are at risk of cracking or rupture. Martech, along with GPT Casing Spacers, have specially designed multi-line casing spacers to accommodate that expansion and contraction and bear the weight of these carrier lines. Thanks to this revolutionary design, these multi-line conduits now have a high safety factor when in operation and allow more carriers to be installed in the single crossing. This saves the refinery in project and design costs, as well as lower the amount of space used in an often crowded system. Multiple carrier lines, safe from heat-expansion damage, in a single casing. Martech and GPT are creating new and innovative cased crossing options for engineers to use in water, wastewater, energy and environmental projects. How can you get more information about this new multi-line casing spacer? Contact Martech for more information about these multi-line casing spacers. Soil compaction and erosion has created a void under this concrete sidewalk slab, causing it to settle and create an unsafe ridge in the sidewalk. Road settlement is a concerns for municipalities and transportation authorities. If soil compaction and erosion occurs under the roadway (or sidewalk), a void will be created under the surface and cause the roadway or sidewalk to collapse and settle into the void causing breaks and ridges on the surface. Sidewalk settlement (broken sidewalks) draw a lot of attention from road maintenance departments because they are more common and may potentially cause more serious accidental hazard. A Honolulu jury recently awarded a California woman more than $3.6 million in damages for injuries she sustained when she fell on a Waikiki sidewalk. What can your department do to avoid a similar accident? Martech, Prime Resins and our contractor partners are successfully introducing Canadian municipalities to the best way to fix sidewalk settlement issues: Precision Lift™ polyurethane expandable chemical grouts. A slab-lifting project with Precision Lift™ requires only a 1 or 2 man crew with a truck to accomplish the job. Typical sidewalk lifting jobs are usually done within 1 hour. The hole in the sidewalks is only 3/8″, instead of the 2″ or more needed for traditional concrete solutions. Precision Lift™ is a permanent fix for settlement issues. The polyurethane grout bonds to the sand and gravel underneath the slab and sets into a permanent stable foundation. The cured materials are also water resistant, and they will hold in place preventing future settlement issues. Find out more about how Precision Lift™ slab lifting can work for your city. Contact Martech for information on how to apply this slab lifting solution in your area. Liang Yu is Martech’s Sales Territory Architect for Municipal Infrastructure in Northern Alberta. Liang can be reached via e-mail (lyu@drivingstrategicsales.com) or phone (800-461-0006 ext 3524).